From a Port Macquarie Cup to a national showjumping champion - Falklands has shown there is a post-racing life for racehorses. After finishing first past the post at Port Macquarie in 2012, he claimed his first Australian Jumping Championship title at Boneo Park last weekend. He was also judged as the best off the track thoroughbred overall. Trainer Marc Quinn guided him to his success six years ago before he rehomed him to his current family in Nyngan. He said the Port Cup winner retired "completely sound" and felt he still could compete in events such as dressage and showjumping. "He was to go there on the premise that it was his forever home," Quinn said. "If they had no more use for him as a showjumper or if he wasn't any good he was to come back to us and we would have re-homed him locally." Falklands won the 2012 Port Macquarie Cup. Photo credit: Nigel McNeil. The Port Macquarie trainer said their search for a home for Falklands' post-racing career was focused on him not sitting in a paddock. "He was only six when he retired so he had probably 10-15 years ahead of him of healthy life and he's been going well since he went there." "When thoroughbreds retire, they are still relatively young for what their lifespan is," Quinn said. "They could go on and be companion horses; a lot of geldings go to stud farms and become nannies for the weanlings. "A lot of them go to equestrian sports like dressage and showjumping." Quinn said trainers were also held accountable. "If a horse leaves our stable even if he goes for a spell we have to notify Racing NSW with a stable return saying where the horse is at," he said. "Then when he comes back into work we do another stable return to say he's back in the stable. "The way Racing NSW have restructured their welfare for horses that are retired, we have to notify Racing NSW where they go," he said. "They're tracked from when they leave the racing industry so they know exactly where they are. Stewards can then turn up at any time and request to see which of the horses are on the sheet and questions are asked. "If your stable has seven in work, there's got to be seven horses there and they have to match the identification with what Racing NSW have got." 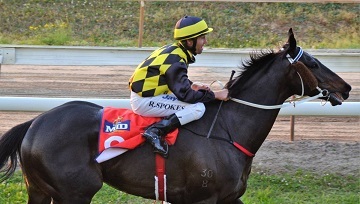 Owner Clint Foot was pleased to see the horse still competing at some level and it was a surprise to see the horse perform strongly. He said the family had looked after Falklands "extremely well" since he was re-homed. "It's great; we still get a lot of joy out of seeing him compete in some respect and to see he's getting well looked after," he said. Foot said while "he was a racehorse, I remember Marc said he's seen his breed jump a fence before."